Hemp has been grown around the world for 10,000 years and has thousands of applications. This Hemp e-liquid has a nice, light and nutty flavour and the primary terpene, caryophyllene, gives it a smooth Earthy finish. Long live hemp! 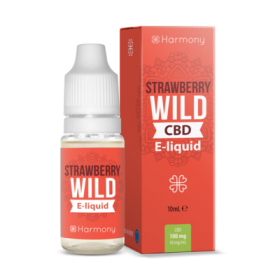 Harmony stands out in the CBD Vape Juice crowd thanks to our unwavering commitment to quality and expertise: Our CBD concentration and composition are certified monthly by independent laboratories. At Harmony we have 10+ years of experience in CBD & Hemp, therefore we can manage the full production cycle from strain selection to product certification. Terpenes are compounds found in a variety of plants and contribute to their flavor, scent and color. They interact synergistically with cannabinoids to create what scientists refer to as an “entourage effect” that magnifies the effects of the plant’s individual components. CBD’s are compounds produced by and extracted from hemp. CBD is a non-addictive, non-toxic and non-lethal compound, that is why CBD is becoming the best choice among vapers.